Over 1000 people around the world work for the Gemological Institute of America and its affiliate companies. Some are gemologists who are dedicated to the study, grading, and identification of gemstones. Some are educators who are committed to teaching. The rest are highly skilled professionals representing almost every aspect of the business world. This diverse and highly talented group works as a team to fulfill the Institute's mission to educate and serve the international gem and jewelry industry, and thereby ensure the public trust. The Gemological Institute of America offers a competitive benefits package to its employees. Applicants and new hires are subject to background checks, including reference checks and work history verification. Pre-employment drug testing is required for all potential employees. The Immigration Reform and Control Act requires employment eligibility certification for all employees. All job offers are contingent upon completion of the I-9 verification process. The Gemological Institute of America is an equal opportunity employer and does not discriminate against persons on the basis of race, religion, national origin, sexual orientation, gender, marital status, age, disability, or veterans status. You can find all the details and application requirements on the GIA web site. Social networks are popping up all over the place these days. So, far I've joined a few, but honestly, I have yet to really immerse myself in any of them because, (a) I don't have the time, and (b) I honestly just don't get them. If I have one more weird old man wanting to be "my friend," I'm going to scream! So, this new fashion related network I recently heard about claims that they are not a social network but rather a Business network. We'll see. It does sound interesting and could hold some career hope for those in the jewelry business. I kind of like the idea of a network of jewelry designers and jewelry lovers working together. Well, you decide. Is it a social network or something else? The Fashion Industry Network (www.FashionIndustryNetwork.com) is a business networking community designed for the fashion industry. The network allows individuals the opportunity to develop personal profiles to highlight their professional experience in the fashion industry. After profiles are created, members may freely join groups that pertain to their area of expertise. For example, if the member is a "pattern maker" they will join the Pattern Making Group. As pattern making can be considered a function of design, a pattern maker would also be welcome in the Design Group if they were so inclined. In addition, they may wish to enter into discussions with people in the Clothing Manufacturing Group. Being persistent and surrounding yourself with positive, encouraging friends and associates can catapult your business into the big time, jewelry-design powerhouse Judith Ripka told attendees of the Women's Jewelry Association's Women in the Know Conference at the Fashion Institute of Technology on Friday. Passion for creating jewelry can also take your business a long way, she added. "Even if it had not become my business, I would still design jewelry," Ripka said. "Persistence is one of the keys to my success. I've sketched two days a week religiously for 34 years." But when Ripka started out, she was a struggling mother of three running her business out of the living room of her house in Long Island, where she was one of the few working mothers in her neighborhood at the time. She balanced caring for the children with sketching during all of her free moments, initially selling jewelry out of her own living room from a $12 case she bought in the Bowery section of Manhattan. Her business got off the ground with a $1,000 loan from a dear friend who was among those who encouraged her as she began making jewelry at a manufacturing facility in 1973, Ripka said. Other friends lent her cars to get around since she didn't own a vehicle. "Don't have anyone around you who doesn't wish you well," Ripka said. "There were countless people along the way who told me to give up, that the chances were slim. But I am telling you, the chances are not slim." If you are thinking about a career in the jewelry industry or want to expand on your existing jewelry career, then the Jewelers of America web site might be a good place to consider. Jewelers of America contributes to recruitment and education of tomorrow's jewelry industry professionals. Our comprehensive 'Careers in the Jewelry Industry' program, developed by industry organizations and individual jewelers, principally sponsored by the Gemological Institute of America, helps high school and junior college students, career changers and adults re-entering the workforce discover the challenges, rewards and opportunities available in the jewelry field. 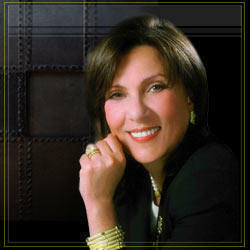 Our guide includes JA member profiles, each with a photo and story recounting what attracted them to the jewelry field. This guide encourages job seekers to consider and enter the industry. 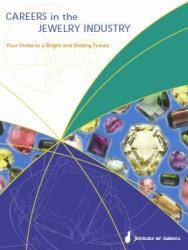 The guidebook includes comprehensive overviews of ten different career paths – sales associate, manager, bench jeweler, mass manufacturer, wholesaler/importer, appraiser, watchmaker, designer, laboratory grader, and educator – including salary ranges and job-training resources. We distribute a condensed, brochure version to high schools, junior colleges and adult career counseling centers nationwide. Brochures are display-sized and available to JA members. It took only one jewelry party for jewelry designer Cheri Larson to realize she was meant to make jewelry as a business. It took a little later for her to realize she should turn her business model of home shows and jewelry into an opportunity for other jewelry lovers. Like the famous Tupperware parties, jewelry parties are extremely popular these days. Larson's business, Azante Jewelry, is set up in a similar fashion. Azante was launched in 2003 as a direct sales business complete with home shows. All of the jewelry is designed by Larson and made in Green Bay by five employees. "Azante jewelry is handcrafted by women for women," said Larson. They have a small showroom and Internet sales. More than 90 consultants work in 17 states with most being in Indiana. "It's funny that we're in Green Bay but we're less known here than in Indiana," she said. Larson said that the business has grown mostly by success stories though word of mouth. "I love to work with women and help empower them. Direct sales are a tremendous opportunity, especially for stay-at-home moms that want more," said Larson. Because I write extensively about jewelry and making jewelry – it's pretty much my writing niche – I get a lot of questions via email about how to get into the jewelry business. Some readers are interested in become jewelry designers. Others are more interested in the sales side of things, becoming a jewelry sales rep for example. After trying out different jewelry avenues, I finally found that writing about it works for me. With my background in technical writing and my English degrees, writing was a good fit for me. (You'd be surprised how similar writing about how to fly a flight simulator is to writing about how to make a pair of earrings.) However, it took me a lot of years trying out other jewelry related jobs before I settled on this. 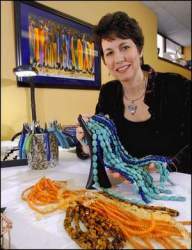 I sold my own hand-crafted jewelry at art shows and through galleries, taught jewelry making classes, and even worked for a while as a sales clerk for a small fine jewelry shop. My point is that trying out different venues related to jewelry was a wonderful learning experience. If, however, you are understandably shy or just unsure about how to jump into the jewelry industry, here are some resources that you might find helpful in your quest for a career in jewelry. If you know of some others, please add them to the comments so we can all check them out. Gemological Institute of America: This organization is well known its classes and other educational opportunities, but it also has a careers web page and very often they run job fairs. So, this is a good resource for not only preparing for a job in a jewelry related field, they may also help you land a job once you are trained. Italy is well-known for its skilled jewelry artisans as well as its fashion forward thinking, so this seems to be the perfect fit for those lucky enough to attend the 4th International Gemological Symposium in San Diego, CA this August. The Jewelry Weblog would love to hear from any readers who plan to attend. The Gemological Institute of America (GIA) invites attendees of the 4th International Gemological Symposium to an Italian-themed gala evening of jewelry trend forecasting at the Manchester Grand Hyatt in San Diego, California on August 29, 2006. Sponsored by the Vicenza Fair, in collaboration with TJF Group, the Italian Jewelry Guild is producing the special social event, titled "Moods, Sensations, Differentiations: the Soul and Future of Italian Jewelry." The event will feature a dinner and a unique look at future trends in Italian jewelry and fashion as well as worldwide lifestyle and social trends that affect the items people produce, wear and desire. Open only to those who register for symposium, the evening will feature jewelry representing the TJF Group 2007 forecasted mega-trends of Heritage, Cultural Bridges, and Biolosophy (bio-philosophy). Heritage looks to history to inspire new jewelry, while Cultural Bridges merge the styles of different traditional cultures into creative new designs. Biolosophy takes experimental approaches to project an environmentally conscious modern lifestyle with jewelry that embodies a consideration of the past, present, and future. A fashion show with runway models in themed wardrobes will showcase each of these trends. Gemological Institute of America (GIA) has a July job fair coming up both in New York and California. From a company press release: The largest Career Fair in the $120+ billion worldwide gem and jewelry industry takes place in New York on July 28, and again in Carlsbad, Calif. on Oct. 27. It's free, open to the public, and an extraordinary opportunity for job seekers to find exciting and lucrative job opportunities with some of the most recognized jewelry companies in the industry. summer in New York and in the fall in Carlsbad, Calif.
to succeed in the jewelry business. WHEN: New York: Friday, July 28, 2006 9:00 a.m. – 3:00 p.m.
Carlsbad, Calif.: Friday, Oct. 27, 2006 8:30 a.m. . 3:00 p.m.
participated in the GIA Jewelry Career Fair on both coasts.